No announcements were taken during the Forum. The following were left with the scribe or e-mailed in. Blanche Penn announced that The Voice of the People will meet Saturday, Feb. 10 at 10 a.m. at 8823 Albemarle Rd. to discuss housing with Charlotte Director of Housing and Neighborhood Services Pamela Wideman. Flier here. Beverly Earle sent in an announcement of a free Minority Health Conference on Friday, Feb. 23 from 9 a.m.-4 p.m. at UNCC Charlotte Lucas Room. Details here. Tawanna Denmark sent in an announcement of a free community summit on HIV housing priorities on Thursday, Feb. 15 from 10 a.m.-3 p.m. at Friendship Missionary Baptist Church, 3400 Beatties Ford Rd. Register here. More details here. Joyce Waddell sent in a comment about college transfers and class-size mandates. Dena Diorio sent in her Feb. 5 Board Bulletin. Alma Adams sent in her January Congressional Update. 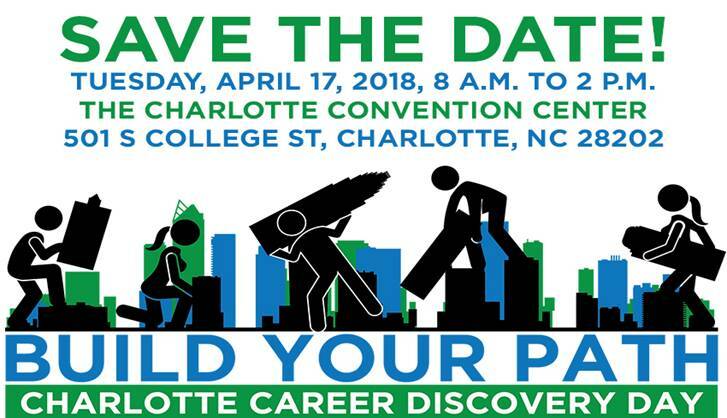 Yolanda Holmes sent in a save-the-date for the Charlotte Career Discovery Day in Tuesday, April 17 from 8 a.m.-2 p.m. at the Charlotte Convention Center. Joyce Waddell sent in a comment about an N.C. Elections Board ruling. Sylvia Grier sent in an announcement that Genesis Project is trying to win a technology makeover. Details here. Keiba Young sent in details of the Digital Charlotte Program Accelerator. Jane Whitley sent in an announcement that Vi Lyles would address Democratic Women of Mecklenburg County on Tuesday Feb. 13 at 6:30 p.m. at Little Rock AME Zion Fellowship Hall, 410 N. McDowell St. More info here. 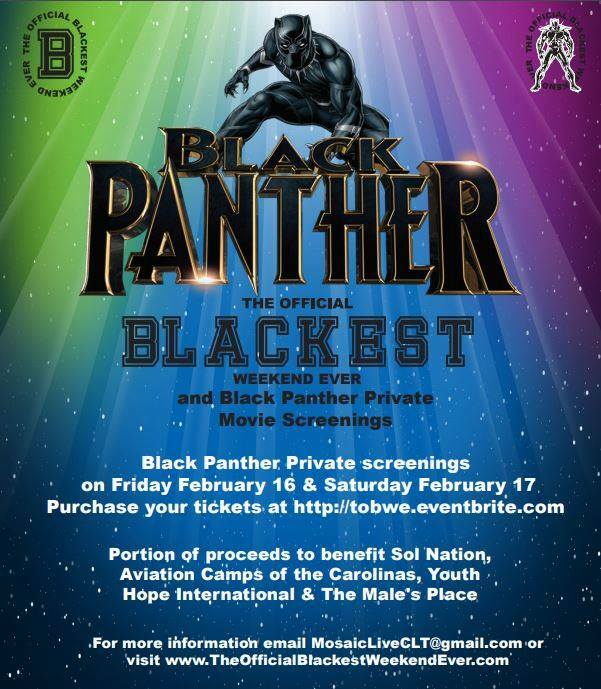 Nakisa Glover sent in information about a Mosaic Live celebration of premiere weekend for Black Panther (the movie). Flier here. More on Facebook and a website. 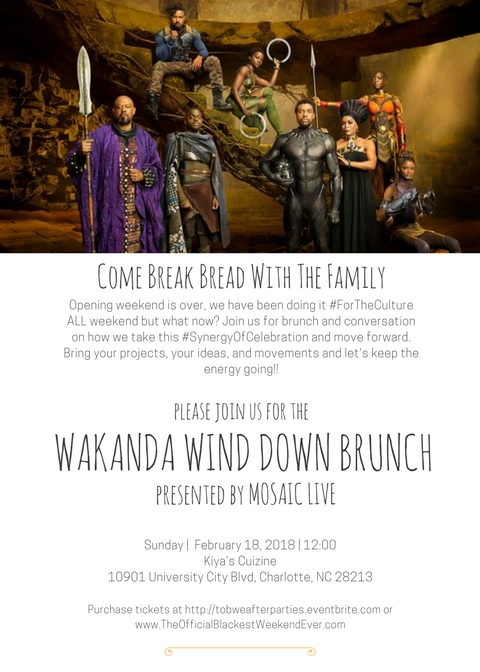 Tiffany Fant sent in an invitation to a Wakanda Wind Down Brunch on Sunday, Feb. 18 at noon at Kiya’s Cuizine, 10901 University City Blvd. Details here. Debbie Snowdon sent in an announcement of a free “political harmony seminar” with East Meck High students on Tuesday, Feb. 29 from 6:30-8 p.m. at 1817 Central Ave. Room 210. Details here. Victor Mack sent in an announcement of presentations by Dr. Paul Gorski at UNCC. on Feb. 13-14. Details here. Flier here. RSVP here.